This month, learn the tips and tricks that you need to create beautiful and lasting everyday make-up looks no matter what your age or skin-type, thanks to Open Colleges student, Kianna Wilson. Are you used to coming home and seeing your face resemble a clown from sideshow alley? Eyes smudged, no foundation left to speak of and lipstick that was all but eaten with your lunch? Or are you not quite sure how to apply make-up? Struggle no longer! 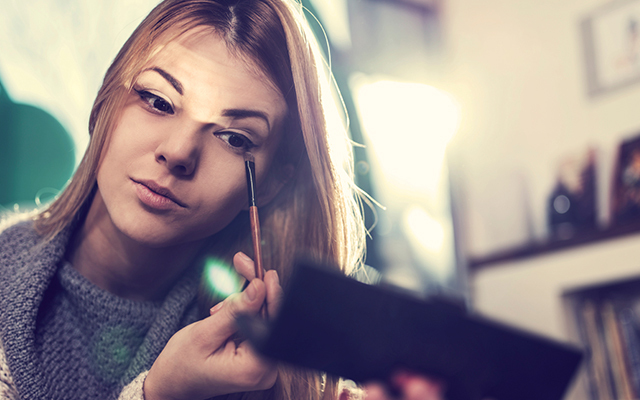 The solution is here in the form of these simple, easy 10 steps to everyday make-up perfection! After cleansing and moisturising your skin apply a primer to your whole face with clean fingers. Applying the primer with your fingers helps to warm the product. Primers are the base upon which your make-up rests, and they help to smooth out fine lines and give your foundation a ‘flawless’ look. Next, grab your concealer and with clean fingers dab it gently over any imperfections on your skin such as under eye circles, around your nose or red marks. Use either a neutral concealer one or two shades lighter than your skin, or alternatively for red marks and spots, you could use a green toned concealer which will tone down the redness. Hint: When applying the concealer under your eyes, try to apply it in a V shape. Select a foundation a few shades darker than your skin tone and a foundation a few shades lighter than your skin for shading and highlighting, plus an exact match foundation for overall coverage. Apply your dark foundation to any areas on your face that you want to look hidden or minimise (like a broad base of the nose or under the cheek bone). Next, apply your light foundation to areas of your face that you want to reflect the light (like above your cheek bone, through the middle of your face for added length or under the eye area to bring light back into sallow skin). At this point you should look like you have war paint on! Don’t worry, this look will enable you to contour correctly by blending. Once you have your contouring on, apply the correct match foundation to the top of your hand. This will help you to avoid contaminating the container with bacteria and other nasties. Apply the foundation on the back of your hand in small amounts from the middle of your face out to your hairline, blending your contouring to a natural look. Applying foundation from the centre outwards, ensures the majority of product ends up in the mid-section of the face where it is needed most and not in the hairline where it will be most visible. Setting powder can be a translucent powder, loose powder or a pressed powder. I personally like to use pressed powder as it gives greater coverage, especially for special events like weddings where the bride needs to maintain her look for several hours. Titanium dioxide is present in these powders so there can be a white residue on the top of the surface of the face if not used correctly. A mineral bronzer can also be used as a setting powder if you prefer a bronzed tone to your skin. Apply your chosen powder by swirling a blush brush on the top of the compact, then tapping it on the top of your non-dominant hand to remove the excess. Start applying the powder in the middle of your face and and roll the brush outward. Again this is to avoid that product build up along the hairline. Remember to blend your powder down under the chin, neck and décolletage areas (minimally to avoid product transfer to clothing) otherwise you will have a definitive difference between the tone of the face and neck especially if the neck/décolletage areas have sun damage. 4. Make those eyes pop! Consider using a tissue under the eye area to catch excess shadow. This is a problem particularly if the eye shadows used are dark as they will lodge in the foundation making it discoloured. Also, make sure you remove any contact lenses to avoid irritation. Start by highlighting the brow bone with a lighter colour (I suggest a soft cream with a matte finish for day wear) using a curved eye shadow brush. Start by swirling the brush in your eyeshadow then tapping it on your non-dominant hand to remove excess. Next, apply the shadow from the outer brow and move inward. Take this colour down to the beginning of the lid. Next, choose a middle colour (complimentary to the highlighter colour and the lid colour which is often darker) and apply from your eye crease, down to the lash line, using the above technique. Remember a soft hand avoids an OMG eye! Finish off your eyelid with a darker colour. Apply this colour along your lash line area using gentle feathery strokes. Hint: If you have close set eyes you need to lighten the inner corner of the eye with the same colour as your brow highlighter. This makes the eyes appear further away from each other! Eyeliner is used on the outer 1/2 of the eye both top and bottom for further definition. To apply your eyeliner, use light, feathery strokes and choose a liner that is closest to your natural hair colour. This avoids prematurely aging yourself by using harsh colours and lines. Next, take an eyeliner blending brush and go over the application blending the line so it will last longer and not run. Consider the use of white eyeliner on the inner rim of the bottom lashes to open up the eyes if necessary. If you are using liquid eyeliner remember to keep your eyes closed for a longer period of time to avoid staining the crease of the lid when opening the eye. There is no time for touch ups on a busy work day! 6. Lashes that command attention! I think the best part of eye make-up is lashes. A girl has to bat those babies every now and then! If you want a more dramatic look, start by using an eyelash curler to curl your lashes up and open up your eyes further. This will give you the starlet look once two coats of mascara are applied. Next, bend your applicator wand to reach difficult outer and inner lashes and then zig zag your mascara through your lashes while you look downwards. This will stop the likelihood of smudging your mascara onto your eyelid and avoids the need for re-touching. Hint: Use waterproof mascara if you tend to have watery eyes or allergies, especially in the winter and spring months. Compliment your eyes with solid, block brows which are popular this year. To get this look, align your brow brush vertically with the base of the nose. The line the brush follows indicates where you begin your brows. Start with what appears to be a rectangle and then gently follow the natural brow curve with feathering pencil strokes. Taper the lines off to a point to complete the outline. To check the length is correct for your eye, measure with your brow brush from the base of your nose to the outer eye at roughly 45 degrees. Next, fill in your outline with your chosen brow powder, gel or pencil taking care to blend this with the outline. If you use a powder a small angled brush is the best applicator. Choose a pencil or powder closest to your natural hair or brow colour for best results. Start by swirling your blush brush onto your pressed blush powder. Tap it on the top of your non-dominant hand to remove excess powder before applying the first part of a tick pattern on the apple of the cheek. Finish the tick by angling the brush upward under the cheekbone. This tick shape frames the cheek structure giving you a more natural face enhancement. Hint: Use a colour that makes you look like you have been out in a cold wind. This is enough for daywear without looking too stage-like. Lip liner is important as it stops lipstick from ‘bleeding’ and running out of the natural lip line. If the lips appear to be scaly or have flaking dry skin use a toothbrush to exfoliate before you begin to apply any fill colour. Starting at the middle of your top lip (at your cupid’s bow), draw an upside down C, then a V in the corners of the lips and a line in the middle of the bottom lip. Next, using feathering pencil strokes join all these points together by moving your pencil around the outline of your lips. Hint: Choose lip liner and lipstick colours that are natural where possible if you are playing down irregular or thick lips. Choose a lipstick that is one shade darker than your liner. Apply this lipstick with flat lip brush making sure to blend with the lip pencil line. When you are happy with the fill amount, fold a tissue in half and press your lips into it to remove excess. If you require more colour repeat the last step. Lastly, apply light lip gloss if you are wanting a glossy shine. Using the steps above you can create a perfect look everyday. And the fantastic thing is that the more you do these steps the faster you will become, so that applying your make-up no longer becomes a long chore, but rather a fast routine! Good luck and enjoy the process! Meanwhile, if you are eager for more beauty knowledge, check out this story on the ‘4 beauty trends for 2016‘. Ready for more than a new look? Whether you’re hoping to change careers or get that promotion, studying for a qualification with Open Colleges could help you reach your personal and professional goals. Study online, in your own time and at your own pace. Find your course now.